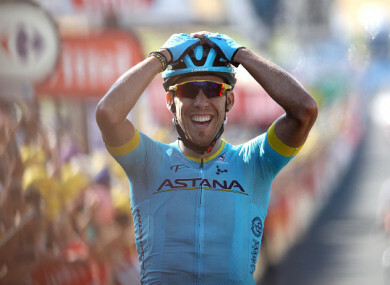 Omar Fraile stayed strong to claim the 14th stage of the Tour de France on Saturday. Fraile reacts after crossing the line on Saturday. SPANIARD OMAR FRAILE ended Belgian hopes of a Tour de France victory on their national holiday with a gutsy, maiden victory on the race on the 14th stage Saturday. Britain’s Geraint Thomas, of Team Sky, retained the race leader’s yellow jersey after crossing the line with teammate Chris Froome and Dutch rival Tom Dumoulin (Sunweb) just over 18 minutes in arrears. ⏪🔻 Relive the last kilometer which saw the solo victory of @OmarFraile! And when Jasper Stuyven (Trek) capitalised on a mid-race spat between Gilbert and Fraile to break away on his own with over 30km to race, it looked like Belgium would have an extra reason to celebrate. When he overtook Stuyven with two kilometres to race, Fraile did not look back. There was frustration for Ireland’s Dan Martin on Saturday. The UAE Team Emirates rider suffered a late puncture just as the peloton swung into Mende, meaning he required a wheel change with just 5km to go. He now sits in 10th place in the GC with eight stages remaining. Email “Dan Martin suffers frustrating puncture while Fraile claims first ever Tour de France stage win”. Feedback on “Dan Martin suffers frustrating puncture while Fraile claims first ever Tour de France stage win”.